Remember to watch this thread, option at the bottom and top of thread. All: (Delayed) We are going to need some Concepts of Balrogs in their lava pits, so I've decided to create a Competition with Ninja. The Competition will start soon, sometime in August. The warp will be /Warp Thang-Comp Remember, they need to be big, and resemble the balrog from Peter Jackson's movies, or take a look at these guys for inspiration! 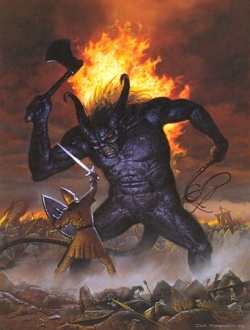 http://www.games-workshop.com/en-CA/Balrog, http://www.games-workshop.com/en-CA/Gûlavhar-the-Terror-of-Arnor or even this concept art: http://tolkiengateway.net/w/images/thumb/4/41/Ted_Nasmith_-_Fingon_and_Gothmog.jpg/250px-Ted_Nasmith_-_Fingon_and_Gothmog.jpg Which gives a basis for all the Balrogs really, make sure it has a horn, a whip, fire sprouting from it's body, and black char skin. l8,Skiin,blue, deathlord: Complete the Wall of the Fortress according to Skiin and l8l's instructions. Skiin, Gandalf, ooitsbirdo: Are responsible for the interiors of the towers outside on the hill. Work Days: On our Work Days, One (or all) of the heads will be online at a designated time to supervise a series of big jobs for the rest of the crew. For now the next planned Work Day will be on Wednesday, 20th of August around 5:00 pm. -Pacific Daylight Time (use a Timezones thingy to find out how that translates to your Timezone.) Hope to see you all there! Only Project Heads may place wool and give out jobs. You may not alter any pre-existing builds if you are not a project leader. Bad mouthing others and making personal attacks is prohibited in this project. Do not build anything at the Main location of Angband unless given a job there, otherwise all your builds go in the Thang-Concept section! Do not post on this Thread, it's only for the purpose of updates on the project. If you are hoping to strike up conversation, please use Private Message! One more update, l8lock_Man is now the 3rd Project Head. Danishkabby resigned from his position yesterday, and is now the Chief Planner again. Thanks for your hard work everyone!